This is a little different from the classic pasta and mushroom dishes in that it does not use cream or dairy as a base for the sauce. The recipe works well with Farfalle shaped pasta, bow ties or butterflies, but any medium sized pasta shape would work. 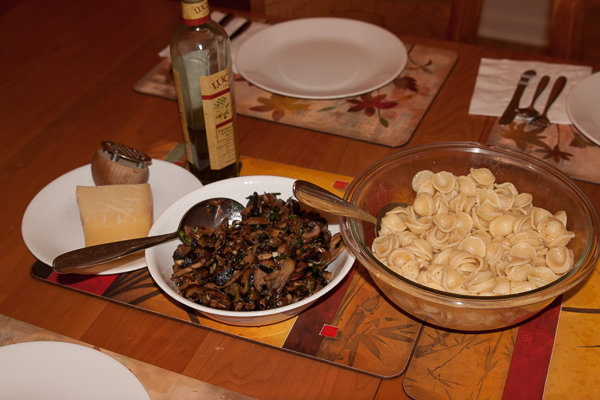 For the pictures I used Orecchiette as that is what I had available. Serves 4 to 6 people as a main course. 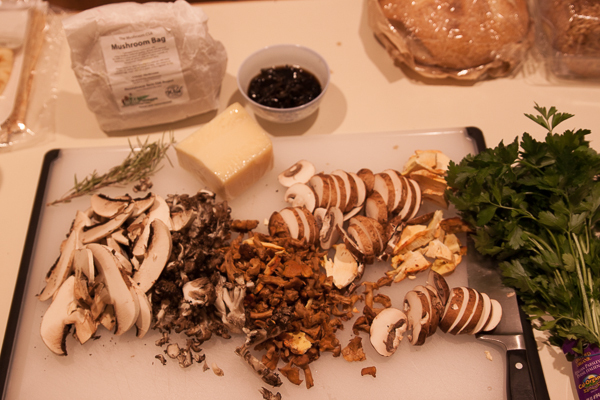 2 lbs fresh mushrooms can be store brought, wild or mixed. Chanterelles or other fleshy mushrooms are good. Soak the dried porcini mushrooms in warm water for 20 minutes. Wash to remove any sand, cut off any hard parts and drain on a kitchen towel. Clean, dry, chop mushrooms about 1/4 think pieces is good. Strip the rosemary leave from the stem and chop with the fresh herbs. When the water is boiling add the pasta and stir to prevent clumping. Melt the butter with 2 tbs olive oil in a sauté pan. 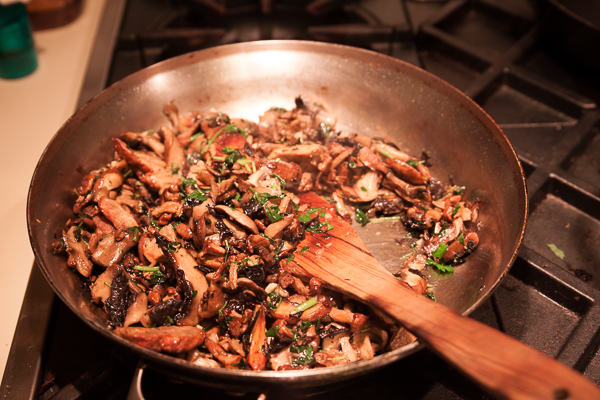 Sauté all the mushrooms, herbs and garlic on high heat in butter and oil until lightly browned with a hint of crust and tender. Season mushrooms with salt and pepper and taste to check. Test to see when the pasta is cooked and drain when Al Dente. 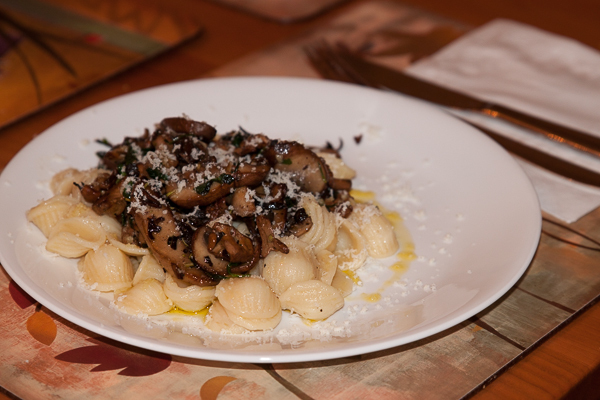 Place pasta in a shallow serving bowl and add mushrooms and drizzle with a good quality olive oil. Serve and sprinkle with grated Parmesan cheese. I used a mixture of fresh and frozen mushrooms including cultivated hen-of-the-woods/Maitake (Grifola frondosa), frozen chicken of the woods (Laetiporus sulphureu), Chanterelles (Cantharellus cibarius) that had been “Dry-Fryed” and frozen. If using store brought button mushrooms try adding 1/2 teaspoon ground cumin to the mushrooms when frying and juice from 1/2 lemon at the end for a different flavor.